At last RootedCon edition our CTO Raul Requero presented to the audience our tool MrLooquer Rating. One of the use cases we presented is the integration of MrLooquer Rating with Cloud environments. This integration solves one of the main problems of security officers, that is having an updated inventory in real time of elements exposed to internet and perform a security analysis automatically. We have developed an AWS Lamba to make almost immediate starting monitoring your Cloud infrastructure with MrLooquer Rating. 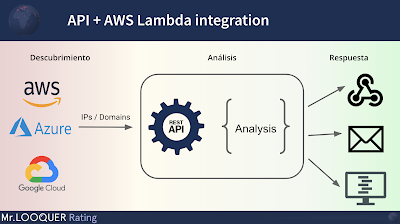 To show how it works we shown a video with a real demo of an AWS account where the lamba is deployed and immediately all new instances launched are provisioned to MrLooquer Rating and analyzed. Thank you to RootedCON organization for such a great opportunity to share our tools there! If you want to test it by yourself you'll just need an authentication token that you can get from our web service. We are glad to announce that we have officially published IOCFeed in RootedCON X edition. IOCFeed is the new OSINT (Open Source INtelligence) resource available to security community that provides dual stack information about threats in Internet. This data source can help analysts to do threat analysis. The main goal of this feed is to help security analysts with valuable insight that allows finding interesting connections between IOCs that can be extended to IPv4. Looking at IPv6 information like the prefix analysts can find relationships between threats and determine if a prefix can be considered as malicious, looking at ASN analysts can find statistics of malicious agents present in Internet providers, and other use cases that we will publish in this blog in the following weeks. You are invited to use this feed and give us feedback.